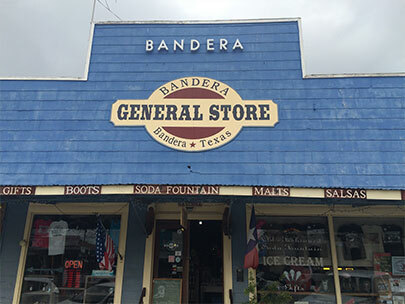 The Bandera General Store building is 108 years old – built in 1907. It has the original wood floors and the original tin tile ceiling. It has been a saddle shop, a feed store, an appliance store (word has it caskets were sold in the basement and during prohibition the cowboys drank beer and played cards on the empty caskets ). The building was also once a movie theater. At one time the projector caught on fire and burned part of the ceiling which is now patched with plywood because the original tin tile ceiling could not be duplicated. The basement is now home to “Arkey’s Silver Dollar Saloon”. It is one of the oldest operating “Honky-Tonks” in Texas. The store housed Bandera’s first movie theatre, The Bantex, and also a saddle shop and western wear store. The Bandera General Store has an antique, fully working, 1950’s Ice cream Fountain. One of only 11 left in Texas. The fountain’s bar was originally a long cutting board used for cutting leather and the cuts and the scrapes can still be seen. It became the counter for ice cream in the 50’s. You can get Malts, Milk Shakes, Floats, Sodas, Freezes, Black Cows, Sundaes and even Banana Splits all made with the famous Blue Bell Ice Cream from Brenham, Texas. Besides our library, the Bandera General Store has the only bookstore in town. We carry modern fiction and biographies as well as Texas/Bandera history books and a large selection of children’s books. 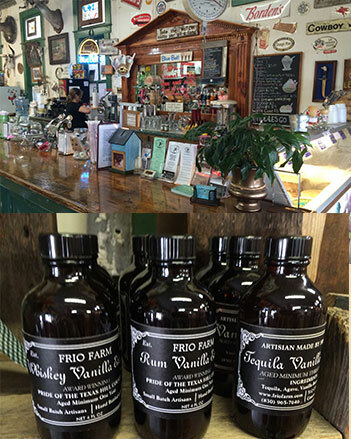 The Bandera General Store has a large food section of locally made Jams, Jellies, hot sauces, honey butter and spices. Stop by and sample and purchase some of the vast variety of foods and unique gifts that we carry. Copyright © 2015-207-17 Bandera General Store All Rights Reserved.